Back pain is an extremely common problem, and it’s certainly not uncommon that you and some of your family members have back pain. Each year, 13 million people visit their GP for chronic back pain.1 This is often seen as a bizarre choice as the Chiropractor has spent 5 years studying how to diagnose and treat back pain! Although we can’t say for sure whether your chronic low back pain is directly associated with your genes, there are several studies to support that there can be a connection between back pain and genetics. Back pain can be caused by a combination of factors, including your age, your job, your posture, environmental factors—even genetics. Basically, ‘genetics load the weapon whilst the environment fires it.’ In the past, researchers had trouble ruling out environmental factors (e.g., stress, smoking, diet) as the only cause of back pain. Today, there is some evidence that shows genetics play an important role in back pain. A growing number of studies are finding that chronic back pain has a strong genetic link—specifically the development of lumbar degenerative disc disease (a disc-related condition associated with the normal wear and tear process of the spine). In fact, several twin sibling studies and genetic marker studies have researched this connection. Below are a couple of the studies that stand out in the correlation between back pain and genetics. 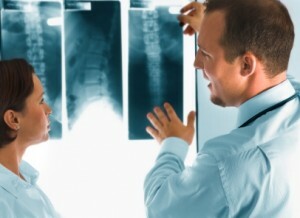 People who have lumbar disc disease were more likely to have family members with disc disease. The risk of lumbar disc disease was significantly increased in both close and distant relatives. Research is now underway to identify the specific genes that influence disc degeneration and back pain. Although you haven’t been diagnosed with a spine condition, we can shed light on this and therefore safely advise you on back pain treatments that can work for you. Low back pain. University of Maryland Medical Centre Web site. http://www.umm.edu/altmed/articles/low-back-000101.htm. Accessed April 18, 2011. Battié MC, Videman T, Kaprio J, Gibbons LE, Gill K, Manninen H et al. The Twin Spine Study: contributions to a changing view of disc degeneration [abstract]. Spine J. 2009;9(1):47-59. doi:10.1016/j.spinee.2008.11.011. Patel AA, Spiker WR, Daubs M, Brodke D, Cannon-Albright LA. Evidence for an inherited predisposition to lumbar disc disease [abstract]. J Bone Joint Surg Am. 2011 Feb;93(3):225-229. doi:10.2106/JBJS.J.00276.